Sometimes I wonder how a person like me came to write a novel about Victorine Meurent and Édouard Manet. I live in a meadow and see more wildlife than I do museums. I wear jeans every day, and belts with big, rhinestone buckles. (See above.) Though I lived in NYC from 1980 – 1987 and studied in Paris for a month in 1983, I’m now a country mouse. Of course, even as I write this, I know it’s a false division of things. Writers always find ways to make their fictional worlds their own. While I was writing Paris Red, as I went about my daily life in northern Minnesota, I was simultaneously living Paris in the 1860s. Living in two worlds made me absent-minded and flaky, and I loved it. The truth is I felt able to write the story of Victorine and Manet because I felt close to her. 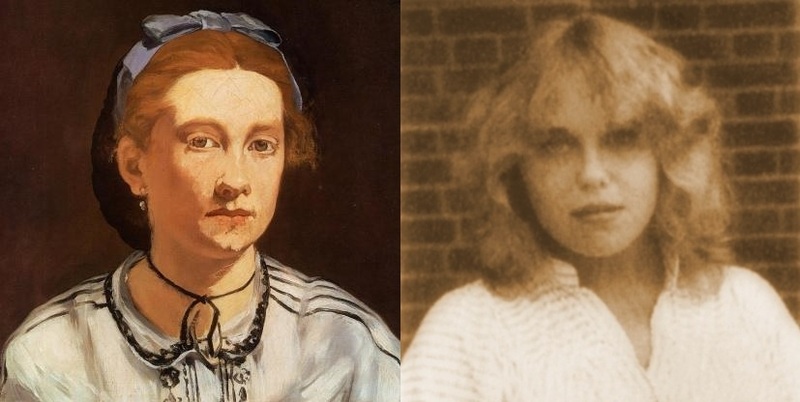 I first fell in love with Victorine in my 20s when I really looked at Olympia, and I fell more deeply in love with her in my 30s when I read Eunice Lipton’s Alias Olympia: A Woman’s Search for Manet’s Notorious Model and Her Own Desire. By 2005, when I began my own research on Victorine Meurent, I’d been thinking of Meurent on and off for almost twenty years—but I still didn’t know I was beginning a project that would occupy me for another decade. And maybe it’s presumptuous of me to feel so close to a work of art or a person I never knew. But it’s the power of Manet’s Olympia—the power of art—that made me fall under the spell of Victorine Meurent. And I think it’s my right and responsibility as an artist to fall in love with my characters, to imagine their lives as accurately and intimately as I can, and to presume to know them. If I don’t, I don’t have any business writing about those characters. So I think of Victorine as my sister, ma frangine, and I think of her as myself. Maureen ~ Who is in the photograph on the right? Is that Victorine? Hi Sara, That’s a photo of me when I was 15 years old. It was an old, grainy black and white picture, so I did a soft focus on it. I think my shirt looks just a little like Victorine’s.